This is exactly innnovation. 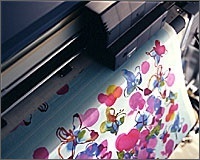 The digital printing technology changed the world of the textile printing. Installed printer: Digital textile inkjet printer "TX-1600S"
In 1935, the company was founded in Mie Prefecture where the place is famous for Ise (a city in Japan) paper stencil. Now, they are based in Fujisawa city in Kanagawa, and run textile printing and plate making bussiness, receiving orders from trading company. Since many Japanese firms are shifting its production to China, Korea, or Southeast Asia, the whole Japanese textile printing industry tends to shrink. It is urgent that the shift from the conventional secondary prossesing work. In this trend of the time, the digital textile printing draws processing industry's attention in Japan. Mr. Nanbu, the third genetration of the company, says that the conventional textile printing and the digital textile printing is "Close but not the same". This means that he sees the digital textile printing is entirely different and new genre while the textile printng by professionals preserves in the future. "The digital textile printing by inkjet printer is innovative textile printing method. Having many colors the smooth gradation can easily be expressed, and picture or illustration can be printed. Though the digital textile printng does not become substitution of traditional textile printing, the digital technology widen the range of expression. This leads to expand the scope of business, which is an innovation for this industry." The company introduced their first printer two years ago, and installed the same model printer last year. Now, they receive the order of the sample production of clothing material, handkerchief, and scarf, or other small to midium lot order. "The one printer is for the main production, and the other is for the sample production. It is effective in the aspect of labor-saving as well, because we can manage about five printers with one person. This is what we found after using inkjet printers." Also, they say that the inkjet printer is really advantageous in small amount production and one of a kind order, since they often receive the request of creating the samples from textile designers. "Now, we cope with the request from the designing area almost perfectly. To cast designer's free thinking into shape, we also need creativity. Then, what support us is the digital inkjet printer. The digital technology draws a sharp contrast with the mass production area, and we think the former is our sales point." From the secondary processing to the primary processing. The company is setting their sights on producing and selling own products. "When making a roll of cloth, the procedure is segmentalized in scouring and bleaching, dip dyeing, plate making, steaming, and finishing. However, the digital textile printing streamlines the production processes allowing for handling the whole process ― from receiving to delivering ― by our own. To step out of the secondary processing, we are looking forward to Mimaki's products as well as the digital textile printing. We dream of manufacturing and sale of the original products such as clothe and bag in the future."